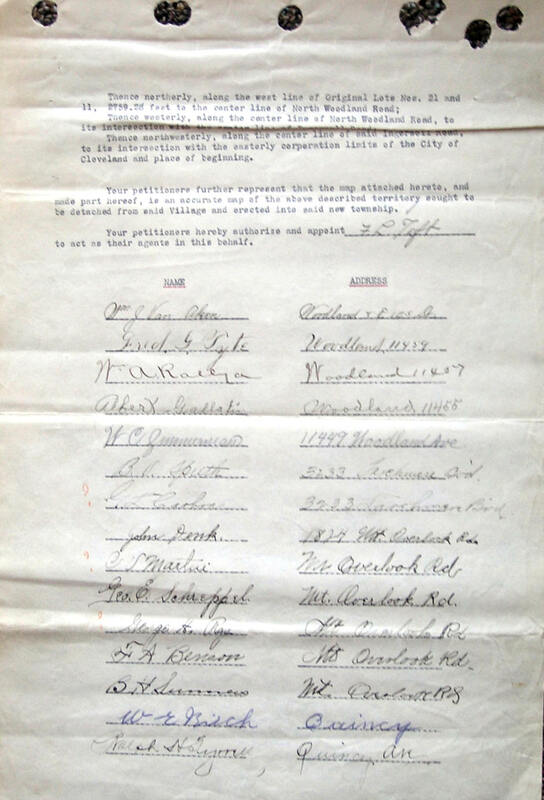 the petition that in July 1911 created Shaker Village out of Cleveland Heights Village. 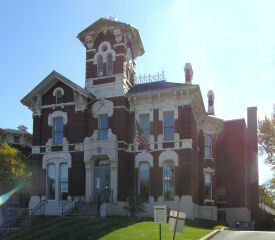 The archives of Cuyahoga County are housed in a large brick annex behind the Robert Russell Rhodes House, built in 1874, on Franklin Boulevard on the Near West Side. 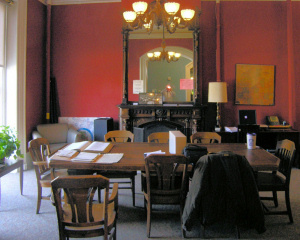 The file box on the table shown on the right contained the original records of several annexations and detachments that took place in the years 1911 through 1915. It included the record of the separation in 1911 from the southern part of Cleveland Heights Village to create Shaker Village. The first step in the founding of Shaker Heights was the petition shown below. The signature of 26-year old William J. Van Aken appears first, suggesting that he had a role in initiating and circulating the petition. It was the beginning of a lifetime of service to Shaker Heights. [more on William Van Aken] The Van Sweringen brothers signed near the bottom of the third page. The last page of this petition in the County Archives, shown above, lacks the customary defined end showing the date it was submitted, and a signature and seal acknowledging its receipt. Thus there may have been additional pages. Other documents showed how the cash and debt of Cleveland Heights Village would be apportioned. Based on the appraised valuation of properties, the new village would get 11.2 percent of the cash held by Cleveland Heights Village, but would also have to assume the same share of its substantial debt. 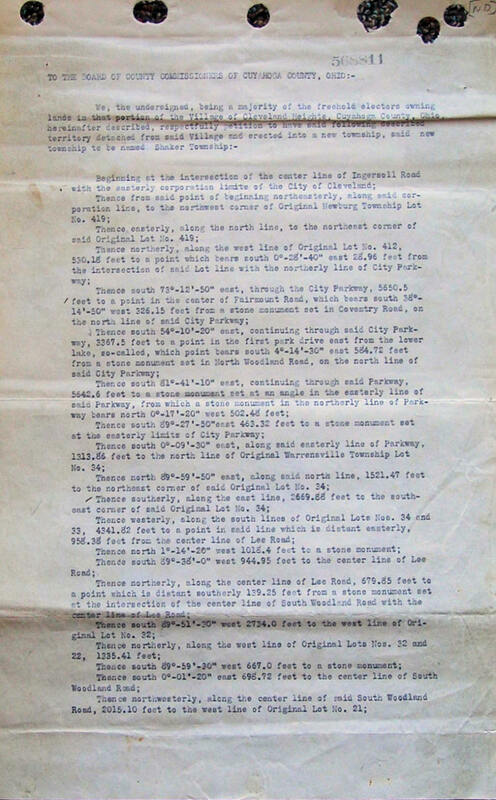 To see more documents related to the founding, including the valuation calculations and the County order that Shaker hold its first elections in August 1911, click here. For the first map of Shaker Village that supported this petition and information on the changes that would soon follow, click here. What is a "freehold elector"? A person who is eligible to vote and owns land in the area requesting separation. 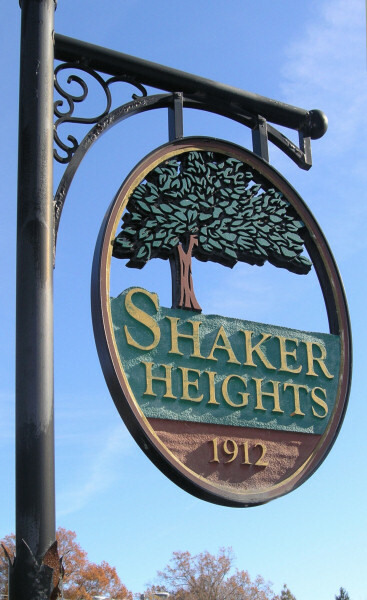 Why did so many who did not want to be in Shaker Heights sign? Most signers lived in two-family homes in the western third of the area, near Cleveland. They were foreign born skilled workers, who had little in common with those building large homes near the Shaker Lakes. For a discussion of their motivations, see this page. The July 6, 1911 Plain Dealer reported the news on page 9. Shaker Heights would be marketed as the finest residential area in the nation. For an example, see a two-page advertisement in the Cleveland Plain Dealer Sunday magazine of September 29, 1912. See the ad, full size (2.4 Mb). 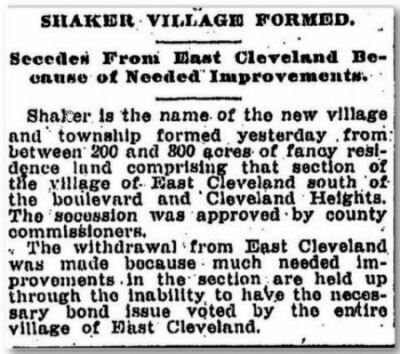 The petition shown above caused a large area in the southern part of Cleveland Heights Village to be detached in July 1911, creating Shaker Village. Only three months later Shaker Village published a legal notice of a referendum to move all but its most western "Woodland" section into a new Village of Shaker Heights. 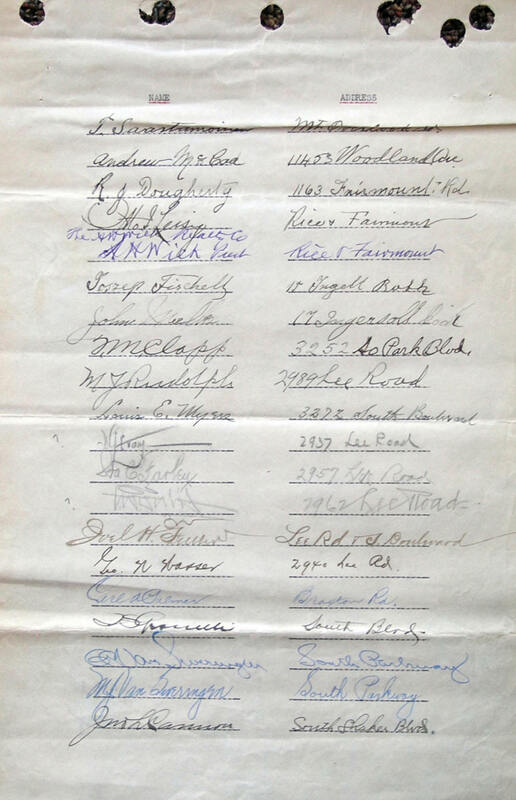 On October 27, 1911 voters came to the Village Hall at 2889 Lee Road - only 14 as William Van Aken would remember many years later - and approved the referendum. Shaker Heights was born. The Encyclopedia of Cleveland History and other sources say Shaker Heights was founded in 1911. In 1961 Shaker Heights marked its 50th anniversary with an advertisement in the Cleveland Plain Dealer that referred to the October 1911 referendum. Some time after 1961 and before 1987 Shaker Heights officials decided to regard 1912, the year it was incorporated and held its first Village election, as its year of founding. Thus it noted its 75th anniversary in 1987 and will be celebrating its centennial in 2012.
side of Shaker Boulevard, 120 feet west of Coventry Road. Taken about 2:pm Saturday, Nov. 5, 2011.
Who lived in the original Shaker Village? Special thanks to Virginia Dawson PhD, who is completing a history of Shaker Heights. Her essay on why the Shaker Square area is in Cleveland, yet in the Shaker Heights school district, is the long-needed definitive answer to that question. She also furnished the key exhibits for her essay: the agreement and John Main's 1953 report. Her permission to publish it inspired me to create what is now an 18-page section on the early years of Shaker Heights. Many of those pages are better due to her advice.